Researchers from the Climate Resilient Cities in Latin America initiative have worked with local communities and government to reveal how water resources will run short in a sub-basin of the Amazon River – and how reforesting and protecting the land can provide long-term solutions. 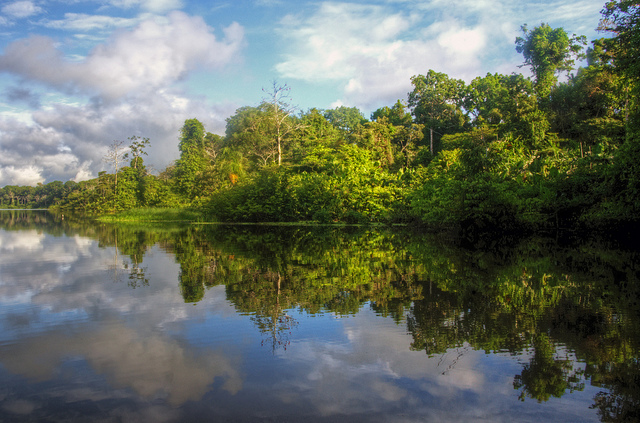 The Climate Resilient Cities in Latin America initiative has unveiled new evidence to show how watershed degradation in the Amazon basin, compounded by climate change impacts, is threatening fresh water supplies for local residents and businesses. Researchers found that restoring forest resources will increase the chances of resilience, in the face of unparalleled human and environmental pressures. However, local stakeholders must back their commitments to forest restoration with a well-resourced, multistakeholder committee to oversee the work and guide the allocation of water among user groups. The project Strengthening climate-resilient development in urban-rural landscapes using a Water-Energy-Food Nexus approach assessed the water security of Tarapoto and the surrounding Cumbaza River basin. The Cumbaza is a tributary of the Amazon, in the department of San Martin, Peru. Tarapoto is the third largest city in Peru’s Amazon region. The research is a joint project of the Global Canopy Programme, Centro de Desarrollo e Investigacion de la Selva Alta, Centro de Competencias del Agua, and Comite de Gestion de la Microcuenta del Cumbaza. The variability of rainfall and peak flows linked to environmental degradation and climate change are affecting water security in the Cumbaza River basin. Restoration and maintenance of forest ecosystem services, or ‘green infrastructure’ should be a priority strategy to create resilience against these pressures. There are significant opportunities for investments in green infrastructure in the Cumbaza basin. The Amazonian rainforests produce vital ecosystem services, which contribute to local people’s wellbeing, as well as to the health of the planet. For example, the forests provide water security by regulating freshwater flows, and reduce erosion. However, rapid urbanisation, agricultural expansion and infrastructure development, compounded by climate change, have created new pressures on forest ecosystems and their ability to provide life-giving ecosystem services. In the Cumbaza sub-basin alone between 1977 and 2005, 58% of the forest cover disappeared. Climate and weather extremes experienced in the Amazon region in recent decades include droughts and unusually heavy rains. The project mapped the interdependencies and trade-offs between natural resource availability and demands on water, energy and food in the sub-basin. They looked at how different groups of natural resource users and different economic sectors – such as farmers, industrialists and domestic consumers – exploited the watershed’s resources. On this basis, the researchers developed scenarios for the future demand and supply of water in the Cumbaza basin for the years 2030, 2040 and 2050. The scenarios are based on different assumptions for socio-economic development (e.g. GDP output per sector; per capita consumption), ecological status (land use patterns and forest cover) and climate change (precipitation trends). The scenarios were obtained through multiple regression analyses. The project was not just an academic exercise: on the contrary, the researchers consulted widely on the assumptions behind the models. They met with private and public actors in the basin and held workshops with indigenous community groups. The current degradation of the Cumbaza basin is putting intolerable pressure on water users: 85% of the basin’s land is now degraded and rates of deforestation stand at 2.5% per year. This degradation has reduced infiltration of rainwater into the soil and has contributed to water surges and burst river banks – a problem compounded because rain now falls more intensively during shorter periods of time, than it used to. As a consequence, there is a marked increase in erosion and in the rivers’ sediment loads. The tributaries of Shilcayo, Cachiyacu and Ahuashiyacu, which provide the freshwater for the city of Tarapoto, are affected. Sediment is overwhelming the city’s water treatment system and with it, the drinking water supplies for the 40,000-strong population – as well as the supplies for industrial and service companies. Scenarios used by the Intergovernmental Panel on Climate Change indicate that these erratic rainfall trends are due to worsen in the period to 2050. The rates of increase in water demand are simply unsustainable. The basin’s population is expected to grow from 177,367 today to 335,000 inhabitants by 2050. This will put pressure on future water supply – and require more energy for water treatment, along with the associated costs. Different user groups in the basin will need to reduce their water consumption and negotiate the allocation of water supplies, in the face of water scarcity. Grey infrastructure alone is insufficient to tackle the problems of water treatment and supply over the medium to long term. Instead, green infrastructure will be needed to complement the grey. Promote conservation and restoration of degraded forests, considering how local people’s empowerment and participation in monitoring and delivering these activities can be achieved. Promote restoration through the cultivation of agroforestry systems that are rich in native species – choosing species that can provide food, biomass (i.e. for energy use), and commercial exploitation (for local income). Restore 3,000 ha. in the upper reaches of the Cumbaza river basin – the basin’s ‘water factory’ – by the year 2040. Restore a minimum of 20% (approximately 1,500 ha.) of degraded areas of the Ahuashiyacu and Shilcayo sub-basins by the year 2050, in order to increase the sediment retention of the land. Avoid further deforestation and land use changes in the Cachiyacu sub-basin. Plant strips of trees in urban and peri-urban areas. Strengthen enforcement of planning codes to avoid untrammelled urban expansion. It will take strong local institutions to implement some of the green infrastructure measures needed to protect and enhance the Cumbaza basin’s water security in a changing climate. This was very much at the front of the project team’s minds, when they finished their analysis and refined their recommendations. The team has presented their findings and recommendations to institutions for basin management and indigenous communities. The good news is that relevant organisations and mechanisms for sustainable water management already exist in the basin, in fact, one of these, a technical working group, was formed expressly to assist all the project’s activities. It is now a question of how these local institutions can be strengthened and enhanced to tackle present and future pressures. Cumbaza’s Water Ecosystem Services Compensation mechanism provides finance for ecological restoration and incentives to integrate efforts between stakeholders and economic sectors. However, it is not achieving its full potential yet, due to low funds. Strengthening this mechanism must be a priority, in order to guarantee long-term conservation of the basin’s water. The multistakeholder Cumbaza Microwatershed Management Committee is already in place, but it also needs to be strengthened and consolidated so that it can more effectively plan and implement measures to optimise water allocation in the basin. The Committee will also need to improve information management and monitoring systems to support more effective water governance. These solutions aren’t easy, but with so many stakeholder interests at play, bringing everyone together will be the best way to tackle the water scarcity and environmental degradation. Multistakeholder platforms have the potential to support dialogue among urban and rural actors and diverse economic sectors, leading to common environmental standards and planning instruments in everyone’s interest. Hacia la resiliencia hídrica en paisajes urbano-amazónicos by David Sabogal (Global Canopy), Guillermo Carlos (CEDISA), Martha Del Castillo (CEDISA), Bram Willems (CCA). English editing on this blog version: Mairi Dupar and Diana Arguello (CDKN). Read the report: Strengthening climate resilience in urban Amazonia – Experiences from Tarapoto and the Cubaza Watershed in San Martin, Peru. Read more about the Climate Resilient Cities in Latin America programme, of which this project is a part (in Spanish). The overall programme is supported by Fundacion Futuro Latinoamericano, CDKN and IDRC-Canada.